This briefing can also be viewed as a pdf. 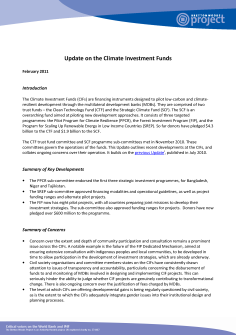 The Climate Investment Funds (CIFs) are financing instruments designed to pilot low-carbon and climate-resilient development through the multilateral development banks (MDBs). They are comprised of two trust funds – the Clean Technology Fund (CTF) and the Strategic Climate Fund (SCF). The SCF is an overarching fund aimed at piloting new development approaches. It consists of three targeted programmes: the Pilot Program for Climate Resilience (PPCR), the Forest Investment Program (FIP), and the Program for Scaling Up Renewable Energy in Low Income Countries (SREP). So far donors have pledged $4.3 billion to the CTF and $1.9 billion to the SCF. The CTF trust fund committee and SCF programme sub-committees met in November 2010. These committees govern the operations of the funds. This Update outlines recent developments at the CIFs, and collates ongoing concerns over their operation. It builds on the previous Update1, published in July 2010. The PPCR sub-committee endorsed the first three strategic investment programmes, for Bangladesh, Niger and Tajikistan. The SREP sub-committee approved financing modalities and operational guidelines, as well as project funding ranges and alternate pilot projects. The FIP now has eight pilot projects, with all countries preparing joint missions to develop their investment strategies. The sub-committee also approved funding ranges for projects. Donors have now pledged over $600 million to the programme. Concern over the extent and depth of community participation and consultation remains a prominent issue across the CIFs. A notable example is the failure of the FIP dedicated mechanism, aimed at ensuring extensive consultation with indigenous peoples and local communities, to be developed in time to allow participation in the development of investment strategies, which are already underway. Civil society organisations and committee members-states on the CIFs have consistently drawn attention to issues of transparency and accountability, particularly concerning the disbursement of funds to and monitoring of MDBs involved in designing and implementing CIF projects. This can seriously hinder the ability to judge whether CIF projects are genuinely contributing to transformational change. There is also ongoing concern over the justification of fees charged by MDBs. The level at which CIFs are offering developmental gains is being regularly questioned by civil society, as is the extent to which the CIFs adequately integrate gender issues into their institutional design and planning processes. A November report by the Global Gender and Climate Alliance and the United Nations Development Programme explores the gender dimensions of CIF policies and projects. It finds that “the current commitment to invest 70 per cent of pledged CIF funding in large-scale CTF energy and transportation programmes and projects — traditionally male-dominated working sectors of the formal economy — risks perpetuating existing gender imbalances in climate change funding”, and that discussions over CTF frameworks have overlooked the relationship between gender, energy use and climate change.2 It also notes that despite a stated commitment to gender parity on governing committees, gender balance remains uneven. For example 13 men and only three women sit on the CTF trust fund committee. The report recognises that SCF programmes have made more effort to integrate gender considerations in their projects, but calls for a variety of proposals to ensure that progress on mainstreaming gender is effective at every level of design and operation. The objective of the CTF is to use minimum levels of concessional financing to catalyse investment opportunities that will reduce emissions in the long term. The CTF focuses on financing projects in middle-income and fast-growing developing countries. As of October 2010 pledges to the CTF totalled $4.405 billion. The trust fund committee has so far endorsed 13 investment plans for a total $4.3 billion for 12 countries: Colombia, Egypt, Indonesia, Kazakhstan, Mexico, Morocco, Philippines, South Africa, Thailand, Turkey, Ukraine and Vietnam; and one regional formation for the Middle East and North Africa (MENA) covering Algeria, Egypt, Jordan, Morocco and Tunisia. As the committee has now endorsed $4.3 billion of investment plans, and has $4.405 billion of pledges, there were no more funding decisions at the November meetings. Future funding of projects will be contingent upon the availability of further pledges. The administrative unit of the CTF pledged to increase transparency through a range of measures, including a report of funding disbursement every six months, and a commitment to supply information on projects implemented through financial intermediaries. Smita Nakhooda of the World Resources Institute (WRI), a civil society observer at the CTF, said “These are significant developments in line with improvements that civil society stakeholders have been seeking over the past months”.4 It remains to be seen how the implementation of this commitment will improve transparency in practice. Discussions of a draft results framework were indicative of concerns that CTF projects, as opposed to other factors, may not be effectively leveraging private sector finance. Pointing to flaws in the existing draft, Nakhooda proposed a results framework designed to truly assess the impact of the CTF on private sector co-financing, understand exactly what has been leveraged, whilst emphasising that this will only work if parties know exactly what the MDBs are financing with CTF funds. However, civil society observers on the CTF have welcomed improvements to the draft of the results framework, which now includes indicators addressing policy and regulatory reform to target institutional and capacity barriers to effective implementation of investment plans. Members were presented with the results of a recent internal strategic environmental, social and gender assessment of the CIFs which had focussed on the CTF. It concluded that social issues and gender were not routinely considered in the design of CTF programmes and these needed special attention as projects were not automatically pro-poor—they had to be designed to be pro-poor6. The committee was briefed on the development of the MENA regional project, with particular focus on the Moroccan solar power development programme. Previous civil society criticism has focussed on how the MENA project is planning to export energy rather than concentrate on energy access. When asked by a civil society observer whether the project would be reliant on exports to the EU the representative of the Morocco Solar Power Agency explained that they anticipate that 30 per cent of power would be exported. They noted further that while export revenue would enhance the viability of the project, it was not integral to its successful functioning. Developing country members of the CTF committee have previously stressed that CTF resources should not be used to subsidise emission reduction efforts in developed countries. The PPCR aspires to demonstrate how climate risk and resilience can be integrated into core development planning and implementation. PPCR funding is disbursed in two phases, to support two types of investment: firstly technical assistance to allow developing countries to integrate climate resilience into national and sectoral development plans, resulting in a Strategic Program for Climate Resilience (SPCR), and second, funding up to $60 million in grants and up to $50 million in loans for implementation of this plan. In 2009, nine countries (Bangladesh, Bolivia, Cambodia, Mozambique, Nepal, Niger, Tajikistan, Yemen and Zambia) and two regional groupings (six Caribbean countries and three Pacific countries) were invited to participate in the PPCR. As of September 2010 donors have pledged $972 million, with $614 million as grant resources and $358 million as concessional finance. Twelve countries have submitted phase one proposals, and $411 million has been approved for financing the corresponding projects. On the issue of disbursement and reporting Ilana Solomon of NGO ActionAid, a civil society observer on the PPCR, proposed a process that would see reporting taking place every three months, “with information on 1) disbursements to date, 2) the implementing and executing agencies through which each disbursement was channelled, 3) the grant and loan component of the disbursement, 4) brief description of the activities to receive support”. Despite this the sub-committee approved only a semi-annual report. There is no clarity on the exact information the future reports will contain. Information on what the MDBs have disbursed to countries, and when, is necessary to evaluate the timeliness and effectiveness of the PPCR. There are ongoing concerns over the fees demanded by MDBs for their work in assisting countries throughout the PPCR process. MDBs are still requesting significant fees for this service. For example for the Niger Community Action Project for Climate Resilience (PACCR) the World Bank has requested $480,000 in fees for preparation and implementation7. Doubts remain over whether these charges reasonably reflect the size or scope of the projects. During discussions of Bangladesh’s SPCR concerns were raised over the level of community participation and consultation, and whether these were used to determine investment. A civil society observer on the PPCR questioned the level of consultation with local communities in rural areas. Members also raised some concerns over the extent to which gender was taken into account in some of the SPCRs. The SPCR proposal for Tajikistan proved particularly contentious. Members raised questions about stakeholder participation and how gender issues would be taken into consideration. In response to concerns over gender and participation in SPCR proposals, a civil society observer requested that joint missions, the country-led projects that assist in formulating an SPCR, include at least one civil society representative and one gender expert. Discussion will continue on this point at later meetings. For the Tajikistan SCPR members also questioned whether the large focus of investment in the energy sector, where there is already a significant level of MDB support, could really be considered as additional finance. SREP is still at an early stage of development, having only been approved in May 2009 and launched at the Copenhagen climate summit in December 2009. It aims to help catalyse scaled up investment in renewable energy markets in low-income countries by enabling government support for market creation and private sector implementation. At the June 2010 sub-committee meetings six countries were selected for pilot programmes: Ethiopia, Honduras, Kenya, the Maldives, Mali and Nepal. Pledges to the SREP now total $307 million as of October 2010. The November meetings saw the approval of the SREP financing modalities and operational guidelines, which had to be agreed in order for the programmes to continue planning and work towards implementation. The sub-committee also approved the following alternate pilot projects to be considered if further funding becomes available: Armenia, Liberia, Mongolia, Pacific regional program, Tanzania, and Yemen. There remain strong concerns over the selection criteria of pilot country programmes, with particular reference to whether SREP is working within its mandate to focus on low-income countries (LICs). At present selection criteria do not prevent applications from middle-income countries (MICs), as evidenced in the selection of three MICs for pilot programmes (Honduras and the Maldives), and three for alternate pilots (Armenia, Mongolia and Yemen). Doubts remain over the distinction between CTF project financing, which already focuses on MICs, and SREPs approval of MIC clean technology projects. At the sub-committee meeting this debate was played out in discussions over whether the expert group, who select pilot countries, should explicitly define why certain countries are selected. Members complained that information had not been provided by the committee’s expert group on the rationale for project selection. Letters were also presented by Djibouti and Mongolia inquiring as to what the criteria for selection were that led to their not being selected for SREP. The letters are supposed to be available on the CIF website, but at present the documents consist only of a title page. It has been decided that to resolve this issue bilateral discussions between unselected countries and CIF administrators will be initiated in order to clarify the expert group’s decisions. It remains to be seen whether countries are satisfied with this process. The Solomon Islands also objected to the approval of both the operational guidelines and financing modalities on the basis that they did not adequately support low-income countries and small island developing states (SIDs) as called for in the Bali Action Plan. There was a partial resolution to the debate over whether SREP investment programmes should allow hybrid systems that include non-renewable energy. It was decided that hybrid systems could be included, but if the hybrid system included a fossil-fuel based component, funding for that component would need to come from other sources. This is subject to review after 18 months. The FIP is a financing instrument aimed at assisting countries to reach their goals under Reducing Emissions from Deforestation and Degradation (REDD+)10. It aspires to provide scaled up financing to developing countries to initiate reforms identified in national REDD+ strategies, which detail the policies, activities and other strategic options for achieving REDD+ objectives. It anticipates additional benefits in areas such as biodiversity conservation and protection of the rights of indigenous people. As of September 2010 $558 million has been pledged to the FIP, of which $399 million has been allocated as grants and $159 as concessional finance. In January 2011 a further $44 million was pledged. The FIP now has eight pilot countries: Brazil, Burkina Faso, Democratic Republic of Congo, Ghana, Indonesia, Laos, Mexico and Peru. All countries are now preparing joint missions to develop their investment strategies, which will be submitted by June 2011. Countries requested that an already agreed $250,000 preparation grant, designed to aid this process, was disbursed more expediently. This was approved by the sub-committee. A number of countries have had their preparation grants approved, and Burkina Faso has already completed the joint mission. A civil society observer to the meeting asked how this is going to be taken forward, but as of yet there is no unified process established to move towards greater coordination. Four regional caucuses, managed by the International Union for the Conservation of Nature, were planned to take place in 2011 to finalise details of the dedicated grant mechanism for indigenous peoples and local communities. This grant is supposed to facilitate the active participation of affected communities in FIP investment strategy planning. However, design of the dedicated mechanism has taken longer than expected, and development of investment strategies has already begun. Therefore the mechanism will not be able to facilitate the participation of indigenous peoples and local communities in the formation of FIP investment strategies.